The Beijing 2022 article provides a more specific guide to the XXIV Olympic Winter Games in 2022. Beijing (北京 Běijīng) is China's capital, and its second largest city after Shanghai, with a population of more than 20 million. It has been the capital of the Chinese Empire for much of its history, and became seat of the People's Republic of China after the Chinese revolutions, as well as the country's educational and cultural center. The city is well known for its flatness and regular construction. There are only three hills to be found within the city limits (in Jingshan Park to the north of the famous Forbidden City). Like the configuration of the Forbidden City, Beijing is surrounded by concentric so-called "ring roads", which are actually rectangular. Be prepared for customs and societal norms that are different from yours; see the China article for discussion. However most Beijingers are sophisticated urbanites, so things may seem less odd here than in rural areas or cities in the interior of China. The city has hosted the 2008 Summer Olympic Games and will host the 2022 Winter Olympics. Beijing has a total of 14 districts and 2 counties. In 2010, Chongwen District was merged into Dongcheng. Wikivoyage continues to use the old districts. The remaining ten districts and counties are quite far from the centre. Beijing literally means Northern Capital, a role it has played many times in China's long history. Beijing's history dates back several thousand years but it first became notable in Chinese history after it was made the capital of the State of Yan under the name Yanjing. Yan was one of the major kingdoms of the Warring States Period, some 2,000 years ago. After the fall of Yan, during the later Han and Tang dynasties, the Beijing-area was a major prefecture of northern China. In 938, Beijing was conquered by the Khitans and declared the capital of the Liao Dynasty. The Mongols seized the city in 1215. From 1264 Beijing served as the capital of a united China under Kublai Khan. His victorious Mongol forces renamed the city, Great Capital (大都). From there, Kublai and his descendants ruled their empire from a northern location closer to the Mongol homelands. During this period, the walled city was enlarged and many palaces and temples were built. After the fall of the Mongol-founded Yuan dynasty in 1368, the capital was initially moved to Nanjing. However, in 1403 the 3rd Ming emperor, Zhu Di, also known as Emperor Yongle, moved it back to Beijing and gave the city its present name. The Ming period was Beijing's golden era. The Forbidden City, the Temple of Heaven and many other Beijing landmarks were built in this period. The capital developed into a huge city becoming the religious and cultural center of Asia. In 1644, the Manchus overthrew the declining Ming dynasty and established China's last imperial line - the Qing. Despite the changing political climate, Beijing remained the capital. The Manchu imperial family moved into the Forbidden City and remained there until 1911. The Qing built both the Summer Palace and Old Summer Palace. These served as summer retreats for the emperors and their entourages. During the 19th century, Western countries established foreign legations in the Qianmen area south of the Forbidden City. These came under siege during the Boxer Rebellion in 1900. The Qing dynasty fell in 1911. In the chaotic first years of Republican China, Beijing was beset by fighting warlords. Following the Northern Expedition, the Kuomintang moved the capital to Nanjing in 1928, and renamed Beijing as Beiping ("Northern Peace") to emphasize that it was no longer a capital. Beijing remained a center for education and culture throughout the Republican Era. When the Kuomintang was defeated by the Communists in 1949, the new government proclaimed a People's Republic with its capital at Beijing. Recommended reading includes Peking - A Historical and Intimate Description of Its Chief Places of Interest by Juliet Bredon (written in the 1930s, ISBN 0968045987), and Twilight in the Forbidden City by Reginald Fleming Johnston (ISBN 0968045952). Beijing is characterised by its vastness and large distances between locations. The city used to be almost entirely made up of hutongs with narrow lanes and single story buildings. Now, many of the hutongs have given way to broad boulevards and modern buildings, contributing to an airy, sprawling feel, in sharp contrast to cities like Hong Kong and Shanghai. Beijing is the political centre of the country, with official buildings and embassy areas dominating the city. Beijing is also the historical and cultural centre of China with many historical buildings and sites - especially within Ring Road Two. The city has undergone rapid modernisation, with improvements of institutions, business environment and work conditions. Given their city's historical, cultural and political heft, Beijingers are justifiably proud to be citizens of the capital. An attitude known as 大北京主义 or "Great Beijing-ism" is often used to describe their attitude toward people from other regions of China. They are often much more interested in politics and willing to talk about current events than people elsewhere in China. Beijingers also seem to focus on not losing face and often use humor in order to do so. However, many Chinese from other provinces find Beijingers very friendly and straightforward comparing with people from Shanghai especially. Beijing has a monsoon-influenced continental climate with hot, humid summers and cold, dry winters. The best time to visit is in September and October, during the "Golden Autumn" (金秋). Spring is the season for dust storms and is otherwise warm and dry. Summer can be oppressively hot and the tourist crowds tend to be the largest as well; prevailing winds from the south trap pollutants (mountains lie to the north and west), making summer the worst season for air quality. Winter is cold and dry, with infrequent, but beautiful, snow. Temperatures can easily fall below −10°C in winter and or just as readily rise above 35°C in summer as well. Beijing has a population of 17.55 million people (30% migrants) living on 16,800 km2 distributed in 18 districts. The city borders Hebei Province to the north, west and south and Tianjin Municipality to the east. The Last Days of Old Beijing: Life in the Vanishing Backstreets of a City Transformed, (Michael Meyer, 2008) An account of life in one of the city's remaining hutong neighborhoods by an American who taught English in a local school as a volunteer during the runup to the Olympics, as the city and its residents clashed over the pace and social cost of redevelopment. Meyer puts his story in the context of Beijing's modern architectural history, an added bonus for readers. Not published in China for five years, until the government could decide on which passages to excise. The language of Beijing is Mandarin Chinese. Standard Mandarin itself was the administrative language of the Ming and Qing dynasties and was based mainly on the Beijing dialect. For language students this makes studying in Beijing an excellent chance to learn the language in a relatively pure form. That being said, Beijing dialect contains nasal "er" sounds at the end of many words. Hence the ubiquitous lamb kabobs (羊肉串 yáng ròu chuàn) become "yáng ròu chuànr". In addition, the Beijing dialect consists of many local slangs which have not been incorporated into standard Mandarin. Beijing taxi drivers are famously chatty and will gladly engage students of the language offering excellent chances to practice the language and get a feel for the changes in the city and country from an "Old Beijinger". English is spoken by staff at the main tourist attractions, as well as at major hotels. Otherwise, English speakers are not common, so always get your hotel's business card to show the taxi driver in case you get lost. Likewise, have staff at your hotel write down the names of any tourist attraction you plan to visit in Chinese, so locals can point you out in the right direction. 1 Beijing Capital International Airport (北京首都国际机场 Běijīng Shǒudū Guójì Jīchǎng, PEK IATA). Beijing's main airport is located to the northeast of the central districts, 26 km (16 mi) from the city centre. It serves a large variety of domestic and international destinations and is where most international airlines choose to fly. It is the second busiest airport in the world by passenger numbers as of 2016. 2 Nanyuan Airport (南苑机场 Nányuàn Jīchǎng, NAY IATA). A former military airfield 17 km (11 mi) to the south of Beijing, now used only by army-linked low-cost operator China United (中国联合 Zhōngguó Liánhé). China United flies daily to Harbin, Dalian, Sanya, Chongqing, Chengdu, and Wuxi. Shuttle buses to the Nanyuan Airport leave Xidan Aviation Building (西单民航大厦 Xīdān Mínháng Dàshà) at 06:10, 07:00, 09:00, 11:00, 13:00, 14:00 and 15:00. The first bus (06:10) might not be available every day. Be sure not to take a shuttle bus to Beijing Capital Airport. Check the shuttle bus direction written on it in Chinese. The bus ticket price is ¥16. Beijing has many railway stations. Most trains arrive at the Central, West, South or North stations. Subway line 2. The subway station can be seen as soon as you get out of the station. Taxi. May be expensive and slow. Buses. A great amount of buses serve the station near the road or at the sides of the station. But always remember that Beijing Railway Station East （北京站东 Beijingzhandong） and Beijing Railway Station（北京站 beijingzhan） bus stops serves the station, but not Beijing Railway Station Crossing West and East（北京站口东/西） where is quite distant to the station. 4 Beijing West Railway Station (北京西站, Běijīng Xīzhàn). The largest train station. Destinations include: Changsha, Chengdu, Chongqing, Datong, Fuzhou, Guangzhou, Guilin, Guiyang, Hefei, Hohhot, Hong Kong, Kunming, Lanzhou, Lhasa, Ningbo, Qinhuangdao, Sanya, Shenzhen, Taiyuan, Urumqi, Wuhan, Xi'an, and Xiamen. Also, the twice-weekly international through-carriage from Hanoi, Vietnam arrives here. Both "conventional" and high-speed trains (wherever available) to these destinations use Beijing West, although HSR does not (yet) leave the country (but it does go to Hong Kong SAR). See below for transport options leaving the station. Subway. Lines 7 and 9 stop here. Taxi. There is an underground taxi rank, which usually has at least a ten minute queue. Taxis may be expensive, especially if you have that tourist stench about you. Inevitably a tout will offer to take you out of the queue for an agreed price, but this will result in a significantly higher fare. Public Buses. There is an immense amount of packed public buses that reach most destinations around downtown Beijing - however this can be difficult to navigate. These leave from several locations including directly in front of the train station, east of the train station (there is a largish bus station here) and on the opposite side of Lianhuachi Donglu. If you are desperate to get on the public bus, there is a large sign indicating the routes close to the bus stops on the Beijing West Station side of Lianhuachu Donglu. 5 Beijing South Railway Station (北京南站, Běijīng Nánzhàn). This station is used only by high-speed trains. It offers 70 high-speed services every day to Tianjin, Tanggu, Jinan, Qingdao, Shanghai (under 5 hours), Hangzhou, and Fuzhou. There are also a few services from Beijing South to northeastern China as well as Xiamen. Served by subway Lines 4 and 14 and public buses. 6 Beijing North Railway Station (北京北站, Běijīng Běizhàn). Small compared to the previous three stations, but you might end up here if coming from Inner Mongolia. Destinations include Chifeng, Fuxin, Hailar, Manzhouli, Hohhot, Longhua, Luanping, Nankou, Shacheng, Huailai (via Badaling), Tongliao, and Zhangjiakou. It also offers tour train services to Yanqing and the Badaling Great Wall. Served by Lines 2, 4 and 13 via the adjacent Xizhimen station. Closed due to the construction works for Beijing-Zhangjiakou Higg Speed Railway and was scheduled to be reopened around 2022. Most services has been moved to Changping North Station while suburban rail line S2 was moved to Huangtudian Station. 7 Beijing East Railway Station (北京东站, Běijīng Dōngzhàn). Destinations only include Chengde, Handan and Ji County, Tianjin. Just off the Guomao CBD. It is very rare travellers will have to use this station. 8 Huangcun Railway Station. Has just reopened. It is in southern Beijing on Beijing Subway Daxing Line. If having trouble getting tickets to one of the major Beijing stations, try getting a ticket to this station instead. If taking a night train, you're a bit far from the centre, but the subway opens at 05:30. 9 Shunyi Railway Station. Just a short walk away from Subway Line 15 at Shimen station. This station is served by regular rail services, and most of these can be rather slow. Changping North Railway Station (昌平北站 chāngpíngběizhàn). A railway station re-opened to remove existing services from Beijing North Station. Trains here mainky services Inner Mongolia, northeastern Liaoning or further to the northeast. Far from the centre, and the most convient way to get there is to take the bus No.345 from Deshengmen West Transit Hub. Foreigners are allowed to rent vehicles while in China, although they will require a driving license issued by the People's Republic of China. G1 Jingha / Beijing-Harbin (Beijing (Sifang Bridge - Shiyuan Bridge - Huoxian County, Tongzhou - Xiji) - Xianghe (Hebei) - Jixian County (Tianjin) - Jinwei - Tangshan (Hebei) - Beidaihe - Qinhuangdao - Shanhaiguan - Jinzhou (Liaoning) - Shenyang - (Jilin) Changchun - (Heilongjiang) Harbin). G2 Jinghu / Beijing-Shanghai (Beijing (Fenzhongsi - Shibalidian - Dayangfang - Majuqiao - Caiyu) - Langfang (Hebei) - Tianjin (Yangcun)) - Shanghai) — part of the expressway spins off as the S40 to central Tianjin and Tanggu. G6 Jingzang / Beijing-Tibet (Beijing - Badaling Expressway - Donghuayuan - Huailai - Xiahuayuan - Zhangjiakou) - Inner Mongolia - Tibet. G103 Jingtong / Beijing-Tongzhou (Beijing (Dawang Bridge - Sihui - Gaobeidian - Shuangqiao - Huicun - Tongzhou District)) — linked with the G102. G106 Jingkai / Beijing-Kaifeng (Beijing (Yuquanying - Daxing - Huangcun - Panggezhuang - Yufa) - China National Highway 106)) — continues into Hebei as the G45. S11 Jingcheng / Beijing-Chengde (Beijing (Taiyanggong - Wanghe Bridge - Gaoliying - Huairou - Miyun - Gubeikou) - Luanping (滦平 Luánpíng, in Hebei) - Chengde) — this becomes the G45 in Hebei. S12 Airport Expressway (Beijing (Sanyuanqiao - Siyuan - Beigao - Xiaotianzu - Beijing Capital International Airport)). S32 Jingping / Beijing-Pinggu (Beijing (Huanggang Bridge - Pinggu)) — this becomes the S1 in Tianjin. G101 - Jingshen Road (Beijing - Shenyang, Liaoning). G102 - Jingha Road (Beiling - Harbin, Heilongjiang). G103 - JingJinTang (Beijing - Tanggu, Tianjin). G104 - Nanyuan Road (Beijing - Fuzhou, Fujian). G105 - (Beijing - Zhuhai, Guangdong). G106 - (Beijing - Guangzhou, Guangdong). G107 - (Beijing - Shenzhen, Guangdong). G108 - Jingyuan Road (Beijing - Chengdu - Kunming, Yunnan). G109 - Fushi Road (Beijing - Datong - Yinchuan - Xining - Golmud - Lhasa, Tibet). G110 - (Beijing - Zhangjiakou - Hohhot - Baotou - Yinchuan, Ningxia). G111 - (Beijing - Fengning - Jiagedaqi, Inner Mongolia). Long-distance buses from areas as far as Shanghai and the Mongolian border connect to Beijing. You can reach areas as far as Harbin or Xi'an on a single bus ride. Beijing has over 20 long distance bus stations, but what you need to do is go to the bus station located on the edge of the city in the direction you want to travel. 10 Xizhimen Long Distance Bus station (西直门长途汽车站 Xīzhímén Chángtú Qìchēzhàn), ☎ +86 10 62183454. Handles buses heading north and west. Destinations include Anshan, Baochang, Baotou, Binzhou, Boshan, Changchun, Chengde (4.5h), Chifeng (12h), Daban, Dazhangzi, Fengshan, Harbin, Hohhot, Huimin, Jinan, Jining (Shandong) (7h), Jinzhou, Kuancheng, Lindong, Linhe, Luanping, Ningcheng, Pingzhuang, Qinhuangdao (7.5h), Tieling, Leling, Pingquan, Xilin, Shenyang, Shacheng (5h), Shanhaiguan, Shenmu, Shizuishan, Tangshan (5h), Weixian (8h), Wudan, Xuanying (7h), Xinglong, Yinchuan, Yingxian, Yulin, and Zhangjiakou. 11 Deshengmen Long Distance Bus Station (德胜门外长途汽车站 Déshèngménwài Chángtú Qìchēzhàn), ☎ +86 10 82847096. Also handles buses for the north and northwest. Destinations include: Baochang, Chicheng, Dongmao, Guyuan, Sandaochuan, Yuxian, and Zhangjiakou. 12 Dongzhimen Long Distance Bus Station (东直门长途汽车站 Dōngzhímén Chángtú Qìchēzhàn), ☎ +86 10 64674995, +86 64671346. Handles buses heading northeast. Destinations include Changyuan, Chengde (4½ hr), Chifeng (12 hr), Fengning (5 hr), Fengshan, Guanshang, Huairou district, Jiaozhuanghu, Mafang, Miyun County, Nanzhuangtou, Pinggu district (2½ hr), Sishang, Shunyi district, Wuxiongsi, and Xinglong. Sihui Long Distance Bus Station (四惠长途汽车站 Sìhuì Chángtú Qìchēzhàn), ☎ +86 10 65574804. Handles buses mainly heading east. Destinations include: Changchun, Chengde, Dalian, Dandong, Liaoyang, Tangshan, and Tianjin. 13 Zhaogongkou Long Distance Bus Station (赵公口长途汽车站 Zhàogōngkǒu Chángtú Qìchēzhàn), ☎ +86 10 67237328. Handles buses heading south and southeast. Destinations include Cangzhou (3½ hr, ¥70), Jinan (5½ hr, ¥114), Tanggu (2½ hr, ¥45), Tianjin (1½ hr, ¥35). Lianhuachi Long Distance Bus Station (莲花池长途汽车站 Liánhuāchí Chángtú Qìchēzhàn), ☎ +86 10 63322354. Handles buses heading south. Destinations include: Kaifeng, Luoyang, Shijiazhuang, Taiyuan, Wuhan, and Zhengzhou. Most of the buses from the long distance bus stations will be regular or express buses, which take the expressways; cost from ¥200-600 per trip, have comfy seats, and most rides do not take more than 6–12 hours, but sleeper buses are also available. Sleeper buses, with bunk beds in rows, average about ¥100 per trip, but many go really slowly up hills, avoid expressways, stop at every city or town, provide "meals" which you have to pay extra for, take the potholed National roads to save money, and a bus ride can take up to 24 hours. The average speed is only 40 km/hr on the moderately fast sleeper buses, and the range could be from 25 to 60 km/hr. It may be a good authentic taste of how less wealthy Chinese people travel. Long distance cyclist-tourists will find National Road 109 is a pleasant way to enter or leave Beijing, though lots of work. It immediately enters steep hills on the edge of the city, but sees little traffic, is well maintained and passes though lovely landscape of farmland and forests. It's remarkable how close to Beijing you are, and how far it feels. Though some residents of Beijing know conversational English (especially in the areas frequented by tourists or Haidian District's university cluster), one should not count on finding a taxi driver or passer-by who knows English well. Neither should foreigners with minimal experience with the Chinese language put faith in their ability to pronounce Chinese place names so that a local can understand. Before embarking on a trip around the city, it is best to print out the names of places you want to visit in Chinese characters, or get your hotel front desk staff to write them out for you. When going to specific addresses, writing nearby intersections or basic directions can be helpful as well. Show the text to the taxi driver, or just ask for help on the street. In general, you will have a better chance of getting help in English if you address younger people, as many schools in China have expanded their English education in the last few years. Crossing the road in China is an art and may be difficult for pedestrians unused to Beijing's particular driving styles. Before crossing, assume that none of the road users will yield to you, even if a policeman is present. Zebra crossings are ignored. Chinese drivers lean on the horn heavily and frequently play games of chicken with pedestrians and other vehicles. Should you hear a loud horn when crossing the road, always look around as there is probably a car right behind you or heading straight for you. Should you find several cars and bicycles veering towards you from different directions, do not try to run to safety; instead, stand still. For drivers and cyclists a stationary obstacle is easier to avoid. Traffic light crossings have zebra stripes painted on the road, but you should only cross when the walk light is green. As with pedestrian crossings in many countries, there is strength in numbers. When a mass of people crosses together cars are more likely to stop or slow down. The Beijing Subway is a good way to quickly get around the city and is clearly marked in English for travelers. The network has expanded at a furious pace, with 18 lines now operational and more being built. Unlike most giant cities' subways, it has a grid-like network which is refreshingly easy to navigate. The subway system shuts down around 22:30, and opens again around 05:00, with signage at the entrance to each station. 1 runs east-west from Sihui East to Pingguoyuan crossing the political heart of the city along Chang'an street, passing the Forbidden City, Tian'anmen Square and Wangfujing. 2 is the inner loop line following the old city walls. The first and last trains start/end at Xizhimen and the line serves Lama Temple and Beijing Railway Station. 4 runs north-south on the west side of the city and serves the Old and New Summer Palaces, Beijing University and Beijing South Station. 5 runs north-south on the east side of the city. 7 runs west-east on the south side of the city. 8 runs north of Nanlouguxiang (line 6) to Changping District, serving the Olympic Stadium. 9 serves Fengtai district, including Beijing West Railway Station. 10 is the outer loop line that circles around the entire city. 13 is an elevated light-rail line serving the northern suburbs. The line starts at Xizhimen and ends at Dongzhimen and passes through Wudaokou. 14 passes through Chaoyang District and then turns west through to the southern suburbs. 15 runs across the north and north-east suburbs of the city. 16 , S1 (also called the maglev line) and Batong , Changping , Daxing , Fangshan and Yizhuang connect the outer suburbs to the city and are of little use for tourists. Xijiao is actually a modern tram line which runs from Bagou station on line 10, passing various tourist attractions like The Summer Palace, to Xiangshan (Frargrant Hills). Airport (aka Airport Express) runs from Dongzhimen, the northeast corner of the 2nd ring road to Capital Airport via Sanyvanqiao. Transfers between lines are permitted with the exception of the Airport Express, for which a separate ticket is required. Subway station entrances are identified by a large blue stylized letter G wrapped around a smaller letter B. Single tickets cost from ¥3 to ¥9 depending on distance (except for the Airport Express, which costs ¥25 per one-way trip) and are only valid on the same day from the station they were purchased. Single-journey ticket machines have English instructions available. The machine does not accept ¥1 bills but if you pay with a ¥10 or ¥20 bill you will be given a handful of coins which you can use for future journeys. You must pass your ticket through the turnstiles upon entering AND exiting the station, so make sure you don't lose it. If you plan on traveling more than a few times, pick up a Yīkātōng (一卡通 ) pre-paid card, which has a ¥20 refundable deposit. Tap the card at the entrance turnstile and again upon exiting. Using the pre-paid card does not reduce the subway fare, unlike bus fares. The card's deposit can only be returned at a few stations, so passing it on to a friend may be easier than getting your deposit back. Stations that offer a refund clearly state "Yikatong refund" in the ticket booth; examples include Xizhimen, Haidianhuangzhuang (only near exits C/D) and the Airport. If you are carrying handbags or luggage, these bags must pass through the X-ray checks at the stations. Dangerous liquids (including oil!) may be confiscated. If necessary, drink a little of your bottle of water in front of the security guards to show that it is not harmful. It is not likely to buy wrong tickets since the ticket machines are easy to buy a ticket from, but if you override stations or when an system error occur and you fail to get out of a station (when the ticket barriers display a red cross on the screen at the top), ask a station staff to help you. It's illegal to dodge the fare (and almost impossible), but a fare dodger will be fined for a large amount of money and may be arrested. Smoking is strictly probihited in subway trains, and anyone who smokes can be asked to stop by any other passenger. Beware that stations and trains become very crowded during rush hour, particularly lines 1, 10, and 13. Follow the crowd and it will be fine, but trying to avoid these hours seems a wise choice. If there are seats available, be prepared for a mad dash as commuters shove and wrestle for the available seats; you may try to do the same if you feel that you are up to the task. Pickpockets are most likely to strike at this moment, so be alert of your belongings. Once known as a nation of bicycles, China today has an ever growing number of private car owners. It is estimated 1,200 more cars hit the streets in Beijing every day. As a result, nowadays you are guaranteed to see more bikes in the Netherlands than in Beijing. However, the infrastructure from its days as capital of the "Bicycle Kingdom" means exploring Beijing on a bike is excellent. The city is flat as a pancake and all major streets have bike lanes. Bicycling is often faster than traveling by car, taxi or bus because of the traffic congestion in the motorized traffic lanes. Four-wheeled motorized traffic in Beijing usually observes traffic signals with the exception of making turns at red lights which is often done without slowing or deferring to pedestrians or bicyclists. Pedestrians, bicycles and all other vehicles (for example, motorized bicycles, mopeds and tricycles) generally do not observe traffic signals. Also, cars, trucks and buses do not defer to cyclists on the road so it is common for a vehicle to make a right turn from an inside lane across a bike lane with no concern for cyclists traveling in the bike lane. Sometimes a right-turning vehicle crossing a bike lane will sound its horn as a warning, but not always. Cyclists also need to be on the lookout for wrong-way traffic in the bike lanes, usually bicycles and tricycles but sometimes motor vehicles, too. Wrong-way traffic usually stays close to the curb so you move to the left to get by them, but not always. Bicycling Beijingers tend not to wear helmets, nor do they use lights at night. Few bikes even have rear reflectors. The moderate pace and sheer numbers of bicyclists in Beijing appears to make bike travel safer than it would be otherwise. While you will see cyclists use many creative paths across wide, busy intersections in Beijing, the safest way for cyclists is to observe the traffic signals (there are often special signals for cyclists) and to make left turns in two steps as a pedestrian would. But if you spend any significant amount of time cycling in Beijing, you will probably start adopting more creative approaches. These can be learned by finding a local cyclist going your way and following him or her across the intersection. Several professional bike rental companies, as well as major hotels and some hostels, rent bikes on an hourly basis. For those who need the security of a guide, a bike touring company like Baja Bikes Beijing or Bicycle Kingdom Rentals & Tours would be a great way to go. If you are staying more than a few days a reasonable bike can be bought for ¥200. Ensure that you have a good lock included in the price. The cheapest bikes are not worth the additional savings; you will get what you pay for and they will start to deteriorate as soon as you begin to ride. Spend a little more and get a bike in the ¥300-400 range. Bike rentals may have good bikes, but you pay a high price and run the risk of the bike being stolen. If neither buying or renting a bike fits into your plans, the city has operated a bike-sharing program since 2011. Around 50,000 are available at a thousand sites around Beijing. While the fee is only ¥1 per hour, a deposit of ¥300 is required for first time users. Only electronic payment is accepted. Beijing's bus system is cheap, convenient, and covers the entire city. But it is slow compared to the subway (often caught in heavy traffic), and difficult to use if you do not understand Chinese. But should you speak Mandarin, have a healthy sense of adventure, and a fair bit of patience, a bus can get you almost anywhere. Buses now feature air-conditioning (heating in winter), TVs, a scrolling screen that displays stops in Chinese (and often English), and a broadcast system that announces stops (In Chinese and English). Bus staff speak little English, and bus stop signs are entirely in Chinese. If you are having problems navigating the bus system, call the English-speaking operators at the Beijing Public Transportation Customer Helpline (96166). Warning: Beijing buses can get very crowded so be prepared and keep an eye on your valuables. Indeed, the overhead speakers on more modern buses will announce a warning to this effect on the more crowded lines. Many pickpockets frequent buses and subways, so carry backpacks in the front, and try to put your valuables somewhere hard to access. If you use a Yikatong Card, you should both touch in and out on most bus lines so the system will calculate the right fare for you. If not, you may have to pay the orginal price for the whole route as a fine. You can find a notice above the doors like "下车请刷卡" means you should touch out when "下车请勿刷卡" means you needn't swipe your card when getting off (Usually "Please swipe your card when getting off" in English is printed). Do not get off from doors where you are getting on except you are riding a bus with only 1 door, or you may be considered as fare dodging. Usually you get off from the rear door of a bus which have 2 doors, and the front&back doors when you are riding a bus with 3 doors. BRT buses usually have 4 doors, and you can use any one of them you like. Bus lines are numbered from 1-999. Buses under 300 serve the city center. Buses 300 and up run between the city center and more distant areas (such as beyond the Third Ring Road). Buses in the 800s connect Beijing with its "rural" districts (i.e., Changping, Yanqing, Shunyi, etc.). Buses with a heading of "专" (zhuān means special) usually serves a small area, "快专" (kuàizhuān means express sepcial) provide express point-to-point services, with a much higher fare. The heading of "夜" (yè means night) provide late night services only. Buses numbered between 101 and 199 are usually trolley buses. BRT lines 1 to 4 are Bus Rapid Transit lines which run on another fare system, and you buy the tickets at a station staff or a vending machine (have pages in English). Directions from place to place can be obtained on AutoNavi Maps, Baidu Maps, Edushi (click the bus flash icon) or Mapbar. Most maps are in Chinese, whilst AutoNavi Maps are available in foreign languages inside Apple Maps (when in China) or Google Maps (this is a slightly outdated copy). The Beijing Public Transport Co. website has useful information in Chinese, but appears to no longer have an English page. Most buses with a line number under 200 run daily 05:00-23:00. Buses with a line number greater than 300 typically run 06:00-22:00 (with some exceptions like 302 runs till 23:00). Night buses usually run 22:00-06:00. Many routes get very crowded during rush hours (06:30-09:00 and 17:00-21:00). On major holidays, there will be more frequent service on most city routes. For passengers paying by cash: Most lines from ¥2, charge according to the distance. You can either calculate the price yourself by reading the sign carefully or asking someone for help (That's why having a card is suggested, as calculating the price is quite difficult). Some lines operates on a flat fare. Tour lines and direct express lines (快速直达专线) runs on a special fare system. Read the information at the side of the doors carefully (or riding those buses may be extremely expensive). If you feel it too tiring to calculate the price just get a card, although refunding the card is only available in several places (most airport or major railway stations are usually OK). Minibuses are very common in the countryside outside the urban areas. Privately operated, most trips cost less than ¥10 per short journey and only a little more for longer journeys. Taxis are reliable and are relatively inexpensive. The downsides are Beijing's well known traffic jams, as well as the fact that most drivers cannot speak or read English and some taxi drivers can be recent arrivals who do not know the city too well. If you don't speak Mandarin then it's worth having the Chinese characters for the location ready in advance. Vehicles used as taxis include the Hyundai Sonata and Elantra, Volkswagen Santana and Jetta (the old model, designed in the 1980s), and Citroëns manufactured in China. These taxis are dark red, or yellow top with dark blue bottom, or painted with new colours. Luxurious black executive cars (usually Audis) can also be found, usually waiting outside hotels and can be booked from private companies. They will cost multiple times the equivalent taxi fare to hire. You might not be able to find any official taxis in the more remote areas of Beijing. However, in these places there will most likely be plenty of unofficial taxis. These might be difficult to recognise for travellers, but the drivers will address you if you look like you are searching for a taxi. Remember to negotiate the fare before you go. Local people usually pay a bit less for the unofficial taxis than for the official ones, but the asking price for foreign travellers will often be much higher. Taxis charge a starting fee of ¥13, and an additional ¥2.3/km after the first 3 km. Taxi meters keep running when the speed is slower than 12km/h or when waiting for green lights; 5min of waiting time equals 1km running. Outside of rush hour, an average trip through the city costs around ¥20-25, and a cross-town journey about ¥50 (for example, from the city centre to the northern side of the Fourth Ring Road). Since Spring 2011, there is a ¥2 gas surcharge on all trips. This surcharge is not displayed on the meter, so if the meter says ¥18 the price is ¥20. If the taxi driver "forgets" to switch the taxi meter on, remind him by politely asking them to run the meter and gesturing at the meter box (请打表 qǐng dǎbiǎo), though most can understand "meter please", and all can understand a simple point at the meter. At the end, it is a good idea to ask for a receipt (发票 fā piào) also while gesturing to the meter and making a writing motion. Having a receipt is handy in case you want to make a complaint later or for business reimbursement purposes, and since the receipt has the cab number, you stand a greater chance of getting your possessions back if you forget anything in the taxi. If you want a tour around Beijing and its vicinities, you can ask your hotel to hire a cab for one day or several days. It usually costs ¥400-600 per day, depending on where you go. You can also ask just about any driver to perform this service as most are more than willing to do so. If you have Chinese-speaking assistance, then bargain down the cost. No matter the cost, the taxi is yours for the day and will wait for you at various destinations. Communicating with the drivers can be a problem, as most do not speak English. Many will not even pick up foreign passengers on the street due to the perceived language barrier. The solution should that happen is to go into a nearby hotel and ask the desk staff to call a cab. You can ask that your hotel write your destination on a card to give to the driver. 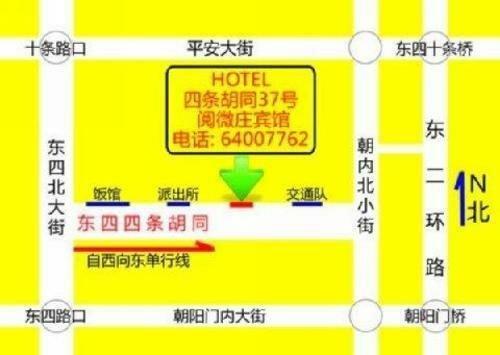 Make sure to take the hotel's card (and a map) that lists the hotel's address in Chinese. This can be a 'get out of jail free' card if you get lost and need to get back via taxi. A regular city map with streets and sights in Chinese will also help. As elsewhere in the world it is really hard to find a taxi when it rains. Most of them refuse to take passengers and, besides, many will try to raise their fares. Although it seems unreasonable (triple to five times the normal fare), sometimes it is better to take their offers than to wait for another cab. All official taxis have license plates beginning with the letter "B", as in "京B". "Pirate cabs" may look like taxis but their license plates will start with letters other than B. It's nearly impossible to hail a pirate cab on the streets; they generally hang out around tourist sights like the Great Wall and the Summer Palace or around subway stops. Pirate cabs will charge you a higher fee for the journey, unless you are a good bargainer, know where you are going, and know what the right fare should be. Sometimes they drop foreign tourists in wrong places. In some extreme cases, the driver may even take them to the countryside and rob them. If you find you hired a fake taxi and are overcharged, don't argue if you are alone, pay the driver and remember the car's license plate number, then call police later. To avoid being taken advantage of, it is a good idea to know the rough direction, cost, and distance of your destination. You can easily find this out from asking locals before calling a cab. Verify these values with the taxicab driver to show them that you are in the know, and are probably too much trouble to cheat. Keep track of the direction of travel with a compass and/or the sun. If the cab goes in the wrong direction for a long distance, verify the location with the taxi driver. For scamming drivers, that is usually enough for them to go back on the right track (without ever acknowledging that they were trying to cheat you). Honest drivers will explain why they are going that way. In addition, sometimes a cab driver might tell you an extravagant price to get somewhere and tell you the meter is broken. There are several "makeshift taxis" running around Beijing including a seat fixed up to the back of an electric scooter. These guys will scam you big time if you don't negotiate a clear fare beforehand. Upon arriving your destination, for a 2 minute ride, the driver will demand ¥300 and will be very belligerent if you don't pay it. Keep in mind that central Beijing can be off limits at certain times, forcing cabs to reroute. And some roads forbid left turns (with big road signs) either at certain hours or all the time, so the driver might make a detour. Driving in Beijing can be quite complicated with seemingly perpetual traffic jams. Many hotels rent cars that come with drivers for up to ¥1,000 per day. Public transport or taxis will get you to most of the main tourist sites and therefore renting a car is not often required at all. Short visa holders (less than 3 months) can get a provisional driver's license at Beijing Capital International Airport or the transportation police stations in the city within minutes. You need to provide your passport as well as your foreign driver's license and do a small examination to confirm you don't have a physical or visual disability that affects driving. With a provisional license you can legally drive cars in China. Ask any information desk at the airport for directions. You can find the counters of many car rental companies in the arrival hall of Terminal 2 in Beijing Capital Airport, although their English is usually not very good. The daily rate of smaller, economical cars is about ¥200-300. You need to deposit around ¥3000 (possible by using CUP/VISA/MasterCard credit card). 20% of cars have to be off city centre roads on weekdays — you are affected on different days depending on the last digit of your number plate. These alternate every 13 weeks. The police have a right to fine you repeatedly if you are caught on the road when you should have left your car at home. If travelling to Tianjin by car, remember they operate the same system in tandem with Beijing's road rationing schedules. On weekends no such limits apply in either cities, which may give rise to worse jams during peak travel hours. Vehicles without a licence registered in Beijing are subject to severe restrictions in the capital — most need a special permit to enter the part of town inside the 6th Ring Road, and for those which are granted this licence, it must be renewed nearly every week. You must have your passport / Chinese ID, driving licence and vehicle licence ("blue book", not larger registration certificate) with you at all times, especially when leaving or entering Beijing, as you will be checked by the police. Beijing, as a railway hub, has many railway stations. If you are travelling between them, you can even choose the national railway. Sometimes the train is the best way to go to places where don't have a good bus or subway connection. However, waiting for them takes a long time. Sub-Central line from Beijing West station to Tongzhou Railway station. All trains call at Beijing Railway Station and Beijing East Station. Not so many trains serve the line, but it can be a wise way to travel through the center of the city, especially during peak hours when the roads are too busy, buses and the metro are crowded, but the trains are quite "empty". S2 line, from Huangtudian station (near Huoying subway station on lines 8 and 13) to Yanqing, is a good choice if you are going to the nothern suburbs, especially during morning and evening rush hours when the freeway is extremely crowded. All trains call at Badaling station where you can take a free shuttle bus to Badaling Great Wall. Some trains also stop at Nankou station between Badaling and Huangtudian. A train extends the service to Kangzhuang or Shacheng on Mondays, Fridays, Saturdays and Sundays. Fares are ¥5 for one station and ¥6 for more than one on the main line, and ¥16 from Huangtudian to Kangzhuang or Shacheng. This is the only suburban railway line that a standard Yikatong card can be used, but your card should at least have a balance of ¥16. This line was described by the Chinese media as "The most beautiful commuting routine" and attracts many visitors. Trains from the city during evening rush or to the city in morning rush may be really crowded. S5 line, from Huangtudian to Huairou North in the northeastern suburbs, reaches Huairou town and Changping North station. All trains call at Changping North Railway Station. However, there are only two "pairs" of trains per day, one pair in the morning and one in the afternoon. Fares are ¥6 one station and ¥9 more than one. S9 line from Beijing East Station to Jizhou which is in Tianjin. It uses the name of Beijing Suburban Railway, but is operated by National Rail long-distance trains. A journey takes 40 minutes and is cheaper than buses. However services are very limited. Get to the stations early for S2, S5 or S9 lines. A S2 line train is equipped with a First class car, a dining car (actually a car with amazing big windows) and standard class cars. Also, getting to stations later than 8:00 may lead you to a great crowd. So if you want to get a good seat to enjoy the great view or at least have a seat to sit down, get to stations early and be ready for a rush to the trains. Gate closes 5 minutes before departure. As a railway rule, this is really important when you are buying a ticket. Use a Yikatong card for S2 line especially during tourist seasons. A S2 train only allows around 700 passengers with paper tickets to get aboard. However, another 850 people with cards are allowed to get on board. So when the tickets are sold out, think of your card! You can also take trains to many other places like Huangcun and Miyvn, but those long-distance trains may not be as conviend as buses. The Yikatong card actually means "Beijing city transportation card" in Chinese. You can get one from most subway stations and every Yikatong service center. Mobile Yikatong cards can also be purchased inside the Apple Wallet on iPhones, change the phone's region to China and then change it back again once you have bought the card. When applying for a card, one should pay a deposit of ¥20. You can charge the card at a subway station, a transit hub, or a service center. The third mainly used Yikatong card is called the suburban railway Yikatong. The only feature that differs from other ones is that it can be used on Suburban Railway Sub-Central line and line S5. The centre of the city and most important landmark is Tiananmen Square near the centre of the city, administratively in Dongcheng District. This is the world's largest public square and a must see for all visitors from abroad and from elsewhere in China. The square is surrounded by grand buildings including the Great Hall of the People, the Museum of Chinese History, the Museum of the Chinese Revolution, the Qianmen Gate and the Forbidden City. It is also home to the Chairman Mao Memorial Hall and the Monument to the People's Martyrs and was also the site of the infamous massacre of student activists by the Peoples Liberation Army in 1989. The National Stadium or Bird's Nest in Chaoyang District is a new major landmark and the symbol of the 2008 Olympic Games. Two contemporary buildings in Chaoyang District are remarkable landmarks: the CCTV Building (sometimes called The Underpants or Bird Legs by locals) and the World Trade Center Tower III. Both are outstanding examples of contemporary architecture. There are also a number of remarkable remains from the medieval city including the Ming Dynasty City Wall Site Park (the only remains of the city wall) in Chongwen, the Drum and Bell Towers in Gulou, and Qianmen in Chongwen. The city's many green oases are a wonderful break from walking along the never ending boulevards and narrow hutongs. Locals similarly flock to Beijing's palaces, temples and parks whenever they have time. The green areas are not only used for relaxing but also for sports, dancing, singing and general recreation. The most important palace, bar none, is the Forbidden city (故宫博物院) at the centre of the city, administratively in Dongcheng District. The Forbidden City was home to the Imperial Court during the Ming and Qing Dynasties. Unlike many other historical sights, the Forbidden City was relatively untouched during the cultural revolution due to the timely intervention of then-premier Zhou Enlai, who sent a battalion of his troops to guard the palace from the over-zealous Red Guards. The Temple of Heaven (天坛) in Chongwen District is the symbol of Beijing and is surrounded by a lively park typically packed with hordes of local people drinking tea, practicing calligraphy or tai-chi or just watching the world go by. The Yonghegong (Lama Temple) (雍和宫) in Dongcheng District is one of the most important and beautiful temples in the country. Entrance fees (2018): ¥25. Just opposite is the Confucius Temple (孔廟); entrance fees (2014): ¥25元; open until 18:00 (17:00 in winter), last admittance 30 minutes earlier. Other parks are scattered around Beijing. Some of the best are Zhongshan Park (中山公园) and Beihai Park (北海公园) in Xicheng District, and Chaoyang Park (朝阳公园) and Ritan Park (日坛公园) in Chaoyang District. The Beijing Zoo (北京动物园) in Xicheng District is famous for its traditional landscaping and giant pandas, however like many Chinese zoos, the conditions for the animals have been questioned. Haidian District is home to the Summer palace (颐和园), the ruins of the Old Summer Palace (圆明园), Fragrant Hills (香山), and the Beijing Botanical Garden (北京植物园). All are quite close together and worth a visit. Nanluoguxiang(南锣鼓巷) Nanluoguxiang a total length of 786 meters and 8 meters wide. The Lane is a north-south channel during Yuan Dynasty, as the Beijing Hutong protected areas. That "the capital city of Square Lane alley set of five," said Luo Guo Lane. 1 JuYong Guan. Juyongguan Pass, also known as Juyongguan in Chinese, is located 20 kilometers (12 miles) north of Changping County, about 60 kilometers (37 miles) from Beijing. It is a renowned pass of the Great Wall of China. Enlisted in the World Heritage Directory in 1987, it is a national cultural protection unit. Olympic Water Park (奥林匹克水上公园). Covering a planned area of 162.59 hectare and a floor area of 32,000 square meters, Shunyi Olympic Rowing-Canoeing Park is designated as the venue for rowing, canoeing and marathon swimming competitions of the Beijing 2008 Olympic Games, and also rowing events during the Beijing Paralympics. The museums in Beijing are generally not yet up to the standard seen in cities such as Paris, Rome and New York. However the city contains one of the largest and most well known museums in Asia, the Palace Museum also known as the Forbidden City. It is also a UNESCO World Heritage Site. China's government is determined to change the backward perception of its museums and has invested heavily in their development. It has also made most of them (not the Forbidden City) free to visit. However, for some museums tickets must be reserved three days in advance. One of the most well-known museums in Beijing is the National Museum (国家博物馆) in Dongcheng District, which was renovated in 2011. The Military Museum (军事博物馆) in Haidian District has long been a favorite with domestic and foreign tourists. The Capital Museum (首都博物馆) in Xicheng District is a new high profile museum with historical and art exhibitions. The China Aviation Museum (中国民航博物馆) located in the Beijing/Northern Suburbs is surprisingly good and hosts 200+ rare and unique Chinese (mostly Russian) aircraft. Finally, a number of restored former residences of famous Beijingers, especially in Xicheng District, give a good insight into daily life in former times. The contemporary art scene in Beijing is booming and a large number of artists exhibit and sell their art in galleries around the city. The galleries are concentrated in a number of art districts, including the oldest and easiest accessible, but also increasingly commercial and mainstream, Dashanzi Art District in Chaoyang District. (Bus Line 401 - departing from Dongzhimen or San Yuan Qiao)Other newer and perhaps more cutting edge art districts include Caochangdi in Chaoyang District and Songzhuan Artist's Village in Tongzhou District. The Great Wall of China (长城 chángchéng) about a 1 hour train trip or 1½-hour bus ride from the city (be aware of bus scams). See Great Wall for general information on the Great Wall and Rural Beijing for listings of individual Beijing sections. The Badaling section is the most famous, but also over-restored and crowded. Mutianyu is recommended over Badaling for the conventional tourist experience. It has been restored to the same degree, but is far less crowded. Jinshanling and Huanghuacheng are more difficult to get to by public transportation but offer a better view of the wall away from the crowds. Simatai is a distant section in the northeast that can be combined with a visit at night to or overstay at Gubei Watertown, a recreated historical village beside the wall. The unrestored Jiankou section is dangerous and widely regarded as the most beautiful. Many of the unrestored or "wild" sections of the wall are suitable for camping or hiking. You may want to bring a jacket against the wind or cold in the chillier season - in the summer you will need lots of water. Hutongs (胡同 Hútòng). Beijing's ancient alleyways, where you can find traditional Beijing architecture. They date back to when Beijing was the capital of the Yuan dynasty (1266-1368). Most buildings in hutongs are made in the traditional courtyard (四合院 sìhéyuàn) style. Many of these courtyard homes were originally occupied by aristocrats, though after the Communist takeover in 1949 the aristocrats were pushed out and replaced with poor families. Hutongs can still be found throughout the area within the 2nd Ring Road, though many are being demolished to make way for new buildings and wider roads. Most popular among tourists are the hutongs near Qianmen and Houhai. The hutongs may at first feel intimidating to travellers used to the new wide streets of Beijing, but the locals are very friendly and will often try to help you if you look lost. Rent a bicycle. Traverse some of the remaining hutongs. There is no better way to see Beijing firsthand than on a bicycle but just be very aware of cars (Chinese driving styles may differ from those you are used to). See above for bike rental information. Hidden City Game. Players explore Beijing's hutongs and parks in a bilingual monthly competition on Sunday afternoons. Includes activities based on Chinese traditions, such as calligraphy, music, art, food, science and games. Restaurants sponsor prizes totaling over to 5000rmb. National Centre for the Performing Arts in Xicheng District was finalised in 2007 and finally gave Beijing a modern theatre complex covering opera, music and theatre. This is worth a visit even if you do not go to a performance. The Beijing Opera is considered the most famous of all the traditional opera performed around China. This kind of opera is nothing like western opera with costumes, singing style, music and spectator reactions being distinctly Chinese. The plot is usually quite simple, so you might be able to understand some of what happens even if you do not understand the language. Some of the best places to watch Beijing Opera are found in Xuanwu District including Huguang Huguang Theatre and Lao She Teahouse. There are also a number in Dongcheng District including Chang'an Grand Theatre. Acrobatics shows are also worth a visit if you want to see some traditional Chinese entertainment. Some of the best shows are found in Tianqiao Acrobatics Theatre in Xuanwu District and in Chaoyang Theatre in Chaoyang District. Drama plays have had a slow start in Beijing and are still not as widespread as you might expect for a city like Beijing, and you will most likely not be able to find many Western plays. However, some good places for contemporary Chinese plays do exist including Capital Theatre in Dongcheng District and Century Theater in Chaoyang District. Classical music has got a much stronger foothold in Beijing than drama plays. Some of the best places to go are the National Centre for the Performing Arts and the Century Theater both mentioned above as well as Beijing Concert Hall in Xicheng District. Opera/Kung Fu Show at LAOSHE tea house (near Tiananmen Square). Foot massage. Have a highly enjoyable and relaxing foot massage and/or pedicure etc (for a fraction of the price in the West) from any of the respectable and professional offerings in central Beijing (in the vicinity of the Beijing Hotel for example). Debate!, Runqiyuan Tea House, 65 Andingmen Dong Dajie. 润琦缘茶馆 安定门东大街65号. W 20:00-22:00. If you think yourself a very argumentative person, are looking for intellectual exercise or just want to meet people you should attend at least one of the meetings of "The Beijing Debate Society" (BDS). BDS is a not-for-profit, non-religious, non-political organisation that seeks to improve argument-building skills. BDS is governed by the British Parliamentarian Debates rules. The debating language is English. free. Beijing Gateway Academy (北京网关学校 Běijīng Wǎngguān Xuéxiào). Branches in Andingmen and Wangjing. A well known language school that emphasizes custom language programs and small class sizes. LTL Mandarin School (邻语堂 línyǔtáng). Specialises in teaching Chinese through a number of Chinese programs including small group classes, individual classes and immersion. Students live with Chinese homestay families, do full immersion trips in smaller cities around China and study in small groups or 1-on-1 in Beijing's Central Business District. Beijing is a very interesting place for gourmet tours and exploration of the cultures and traditions through food. This is a very delicious way to learn new things! Not only do you get a fantastic taste of Chinese cuisine, but you also are acquire new skills and bringing back home a piece of Chinese culture. Cooking Classes in a hutong (Black Sesame Kitchen), 3 Black Sesame Hutong, Dongcheng District, Beijing, PRC 100009, ☎ +86 1369 147 4408. Try to create one of many Chinese dishes — from cold starters to famous noodles and dumplings. A cooking class or a fancy dinner with explanation of major flavors and meaning of different ingredients will be given in English. Reservations are a must! ¥300-350. Hutong cuisine cooking class (Bus stops like dengshidonkou, bus 106/104/684/685 or subway). ¥260 + ¥100 for optional market / pers. Cooking Classes, Tea Tastings, Hutong Tours, Traditional Chinese Medicine, 1 Jiu Dao Wan Zhong Xiang Hutong | Beijing | China 北京东城区九道湾中巷1号 (info@thehutong.com or call), ☎ +86 15901046127. 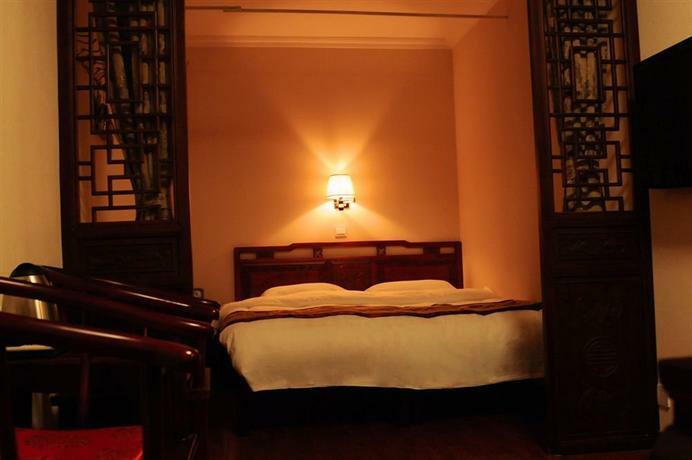 Located in a traditional courtyard home in downtown Beijing, The Hutong offers many different Chinese culture programs. Visitors can attend market tours, Chinese and international cooking classes, tea tastings and tours, traditional Chinese medicine appointments, private meals and events, or just stop by the roof top terrace to get a view of the authentic hutong culture. "The Hutong". Chefs, guides and teachers speak English, Chinese, Spanish, Dutch and more by request. ¥100-250. Beijing is the centre of higher learning in China, with Peking and Tsinghua Universities being ranked among the best in the world. They attract top students from across China and globally as well. Most of the universities are clustered in Haidian District in the northwestern part of the city, and nearly all of the universities in Beijing accept foreign students. Most foreign students are on Chinese language programs which can last from a few weeks to a couple of years. If you have a sufficient HSK level then you can enroll in programs to study other subjects. Tsinghua University (清华大学 Qīnghuá Dàxué). China's most prestigious university for science and technology. Peking University (北京大学 Běijīng Dàxué). China's most prestigious university for arts subjects as well as China's most prestigious medical school. Most of the international business offices are in Guomao, Dawang, around the Eastern 3rd Ring Road, Chaoyangmen. The Central Business District (CBD) is centered around Guomao. Many technology companies have offices in Haidian. Like all of China, finding a job teaching English in Beijing is relatively easy for native speakers. In fact, if you are of European descent some employers may assume that you are already qualified enough to teach English to Chinese students. However, more prestigious employers (especially universities and high-end language schools) will generally require an English teaching qualification and a Bachelor's degree (normally in any discipline, although sometimes specifically in English/linguistics). Throughout nearly all markets in Beijing, haggling is essential. Especially when browsing through large, "touristy" shopping areas for common items, do not put it beneath your dignity to start bargaining at 15% of the vendor's initial asking price. In fact, in the most "touristy" markets final prices can often be as low as 15-20% of the initial asking price, and "removing a zero" isn't a bad entry point in the bargaining process. After spending some time haggling, never hesitate to threaten walking away, as this is often the quickest way to see a vendor lower his or her prices to a reasonable level. Buying in bulk or in groups may also lower the price. How high or low the vendor sets the asking price depends on the customer, the vendor, the product's popularity, and even the time of day. Vendors also tend to target visible minorities more, such as Caucasians or people of African descent. There are a number of interesting markets around Beijing where you can find all kind of cheap stuff. Some of the most popular places are Xizhimen in Xicheng District, Panjiayuan in Chaoyang District for cultural gifts and fake antiques, and Hong Qiao Market in Chongwen District. Silk Street Market (秀水街) was once a hectic market for counterfeit goods but after a renovation in 2016 operates like a normal mall bereft of any good deals. As an alternative to the markets you can go to some of the shopping areas lined with shops. This includes Nanluoguoxiang in Dongcheng District and Qianmen Dajie Pedestrian Street, Dashilan and Liulichang in Xuanwu District. If you are looking for traditional Chinese food shops try Yinhehua Vegetarian in Dongcheng District, Daoxiangcun, Liubiju or The Tea Street in Xuanwu District and Chongwenmen Food Market in Chongwen District. Visiting hotel shops and department stores is not the most characterful shopping in China, but worth a look. While generally significantly more expensive, they are less likely to sell truly low quality goods. The old style of Chinese retailing is gradually being transformed by shops with a better design sense and souvenir items are getting better each year. Silk clothing, table settings and so on and other spots around town, are worth a look, as are porcelain, specialty tea and other traditional items. Some of the most popular areas for this kind of shopping are Wangfujing and The Malls at Oriental Plaza both in Dongcheng District as well as Xidan in Xicheng District. The carpet business is strong in Beijing and you will find all manner of stores selling silk carpets and other varieties. The best way to eat well and cheaply in Beijing is to enter one of the ubiquitous restaurants where the locals are eating and pick a few different dishes from the menu. Truth be told, anyone familiar with Western currency and prices will find Beijing a very inexpensive city for food, especially considering that tipping is not practiced in China. Some of the cheapest and most delicious meals can be had on the streets. Savory pancakes (煎饼果子 Jiānbĭng guŏzi) are one of the most popular street snacks, eaten from morning till night with most carts operating during the morning commute and then opening again at night for the after-club crowds and night-owls. This delicious pancake is cooked with an egg on a griddle, a fried dough crisp is added, and the whole thing is drizzled in scallions and a savory sauce. Hot sauce is optional. Diehard fans often go on a quest for the best cart in the city. This treat should only cost ¥2.50, with an extra egg ¥3. Lamb kebabs (羊肉串儿 yángròu chuànr) and other kebabs are grilled on makeshift stands all around Beijing, from the late afternoon to late at night. Wangfujing has a "snack street" selling such mundane fare like lamb, chicken, and beef as well as multiple styles of noodle dishes, such as Sichuan style rice noodles, but the brave can also sample silkworm, scorpion, and various organs all skewered on a stick and grilled to order. A winter speciality, candied haw berries (冰糖葫芦 bīngtáng húlu) are dipped in molten sugar which is left to harden in the cold and sold on a stick. You can also find variations with oranges, grapes, strawberries, and bananas, or dipped in crumbled peanuts as well as sugar. This sweet snack can also sometimes be found in the spring and the summer, but the haw berries are often from last season's crop. The most famous street for food in Beijing is probably Guijie (簋街/鬼街 Guǐjiē), see Dongcheng District for further detail. Street food in Beijing: Gui Street (簋街) is located within Dongzhimen, East of the street from Second Ring Road of the Western part of the Dongzhimen overpass and West of the street from East Main Street eastern end crossing. Gui Street now showcases many excellent cuisines, the centre of a food paradise. Stretching over one kilometre, 90% of the commercial shops in the street house more than 150 eateries. You can definitely find most of the larger restaurants in the capital here. Peking Duck is a famous Beijing speciality served at many restaurants, but there are quite a few restaurants dedicated to the art of roasting the perfect duck. Expect to pay around ¥40 per whole duck at budget-range establishments, and ¥160-200 at high-end restaurants. Peking duck (北京烤鸭 Bĕijīng kăoyā) is served with thin pancakes, plum sauce (甜面酱 tiánmiàn jiàng)，and slivers of scallions and cucumbers. You dip the duck in the sauce and roll it up in the pancake with a few slivers of scallions and/or cucumbers. The end result is a mouthwatering combination of the cool crunchiness of the cucumber, the sharpness of the scallions, and the rich flavours of the duck. Beijing is also known for its mutton hotpot (涮羊肉 shuàn yáng ròu), which originally came from the Manchu people and emphasizes mutton over other meats. Like variations of hotpot (general name 火锅 huŏ guō) from elsewhere in China and Japan, hotpot is a cook-it-yourself affair in a steaming pot in the center of the table. Unlike Sichuan hotpot, mutton hotpot features a savory, non-spicy broth. If that's not exciting enough for you, you can also request a spicy broth (one that is flaming red, filled with peppers, and not for the weak!) To play it safe and satisfy everyone, you can request a yuan-yang (鸳鸯 yuānyáng) pot divided down the middle, with spicy broth on one side and regular broth on the other. Raw ingredients are purchased by the plate, including other types of meat and seafood, vegetables, mushrooms, noodles, and tofu, so it's also perfectly possible to have vegetarian hotpot. A dipping sauce, usually sesame, is served as well; you can add chilis, garlic, cilantro, etc., to customize your own sauce. While "raw" sounds dangerous, boiling the meat yourself is the best way to ensure that more risky meats like pork are fully cooked and free of germs. In the city center, hotpot can run as much as ¥40-50 per person, but on the outskirts it can be found for as little as ¥10-25. Low-budget types may reuse the spices or cooking broth from previous guests, although it has been boiling for several hours. Beijing provides an ideal opportunity to sample food from all over the country. Some of Beijing's best restaurants serve food from Sichuan, Hunan, Guangzhou, Tibet, Yunnan, Xinjiang, and more. For vegetarians, Beijing's first pure vegetarian buffet restaurant is located a Confucius Temple, see Dongcheng District for further detail. Origus has numerous locations throughout Beijing, and offers an all-you-can-eat pizza/pasta buffet for ¥39, including soft drinks and dessert bar. If you're in the mood for Texan fare, head for the Tim's Texas BBQ near the Jianguomen subway station. They'll happily provide you with your favourite American food and drink. Tony Roma's has a location in Wangfujing (in the Oriental Plaza). Korean restaurants are also very common in Beijing. A frequent meal is the grill-it-yourself barbeque, including beef, chicken, and seafood items as well as some vegetables including greens and potatoes. All luxury hotels have at least one restaurant, which can be of any cuisine they believe their guests will enjoy. You will find French, Italian, American, and Chinese restaurants in most hotels. Restaurants that serve abalone and shark fins are considered the most expensive restaurants in the city. Expect to pay upwards of ¥800 for a "cheap" meal at one of these restaurants, much more if splurging. For those who have a sweet tooth or enjoys snacks, Beijing is a city with a lot more choices. Traditional snacks like "Lvdagun"(驴打滚 means "Donkey rolling in the muddle", made from rice and red beans) "Wandouhuang"(豌豆黄 means the yellow peas, made from yellow peas, soft) "Fulingbing"(茯苓饼 means poria cocos pancake or a fuling pancake, usually made from a mixture of the herbal plant and flour and stuffings) and so many other kinds, but try to get them from supermarkets or they can be more expensive than they worth. One eating in a higher class restaurant can get some as desserts as they are freshly-made, but a lot more expensive. Tea, tea, and more tea! Some shops are in malls and others are stand-alone establishments. Whatever their location, always ask the price before ordering or else brace yourself for the most expensive egg-sized cup of tea in the world. You can experience different styles of tea ceremonies and tea tastings at tea houses especially in the Qianmen area south of Tiananmen Square. These can range widely in quality and price. Some tea houses are really tourist traps whose main goal is to milk you of your money (See warning box). You can get a free tea demonstration at most Tenrenfu tea houses which are located throughout the city and at some malls. A private room or a quiet back table in a tea house with mid-range tea for two should cost ¥100-200. After an afternoon in such shops the remaining tea is yours to take home. Once tea is ordered, the table is yours for as long as you like. As a tea-loving country and grower of much of the world's tea, coffee is not as easy to find but a taste for it—along with more expats dotted throughout Beijing—has seen more emerging middle class and students drinking it. For example, the city alone has 50 Starbucks locations. Most are situated around shopping malls and in commercial districts of the city. Other international chains such as Costa Coffee, Pacific Coffee and so on also have locations around Beijing. Coffee of varying qualities is also available in the ubiquitous Taiwanese style coffee shops such as Shangdao Coffee. These are usually located on the second floor of buildings and oftentimes offer Blue Mountain Styled Coffee, making places like restaurants seem a real bargain. Most coffee shops will offer wireless. Baristas in non-chain coffee shops may not be educated on how to make generally accepted espresso drinks, like lattes and cappuccinos. Espressos of Kaffa Cafe, a local coffee enterprise and coffee technical developing organization, usually taste better and are more consistent. Chinese beer can be quite good. The most preferred beer in China is Tsingtao (青岛 Qīngdǎo) which can cost ¥10-20 in a restaurant, or ¥2-4, depending on size, from a street vendor, but in Beijing, the city's homebrew is Yanjing beer (燕京 Yànjīng), and has a dominating presence in the city (Yanjing being the city's name from its time 2,000 years ago as capital of the state of Yan). Beer mostly comes in large bottles and has 3.1%-3.6 alcohol content. Both Yanjing and Qingdao come in standard (普通 pǔtōng) and pure (纯生 chúnshēng) varieties; the difference mainly seems to be price. Beijing Beer (北京啤酒 Běijīng Píjiǔ）is the probably the third most popular brand. Craft beers are also making an appearance in Beijing, with specialty beers found in various German-themed restaurants throughout the city, as well as Beijing's first dedicated microbrewery, Great Leap Brewing (大跃), located in East Beijing's charming hutongs. Great Wall is the most popular local brand of grape wine. Wine made in China does not have a great reputation, though this is changing. Giving wine as a gift is not a common custom in most places in China and most people will not be accustomed to wine etiquette or appreciation (white wine is often mixed with Sprite). Imported red wines are usually of a better quality and can be found in big supermarkets, import good stores, and some restaurants. The most common hard liquor is baijiu (白酒 báijiǔ), made from distilled grain (usually sorghum) spirits. It comes in a variety of brands and generally for very cheap prices (¥8 for a small bottle) and should be avoided if you want to have a clear mind for your travels on the next day. One famous local style is called Erguotou (二锅头 Èrguōtóu), which has about 40-60% alcohol content and is made by several companies. The local Erguotou is sold in gallon containers, often on the same shelf as water and with a similar price-range and indistinguishable colour. Care must be made not to confuse the two. Maotai (茅台 Máotái), the national liquor, is one of the more expensive brands, and it used to cost about as much as an imported bottle of whiskey—but now it costs a lot more, from ¥1000-2000. Wuliangye (五粮液) is another high-end brands, costs around ¥1000. Due to its mild taste, Wuliangye might be a better option for first time baijiu drinker. A large selection of imported liquor can be found at most bars and big supermarkets. One should better buy expensive liquor (both domestic and imported) from big supermarkets in order to avoid fake ones. Most of Beijing's bars are located in one of the bar clusters around the city. In the beginning there was only one was Sanlitun, but many areas have emerged. Recommended as one of the great pleasures of nightlife in Beijing is walking through a maze of hutong alleys (around Nanluoguxiang) before reaching often hard to find bars. Sanlitun in Chaoyang District was once the centre of nightlife in Beijing and still popular with expats but increasingly uninteresting for travellers and locals. Workers Stadium in Chaoyang District has taken over part of the action in nearby Sanlitun. Ladies' Street in Chaoyang District. By day it has some fashion shops, as its name suggests, but it is also home to some interesting new bars, restaurants and clubs. Yuan Dynasty Wall Bar Street in Chaoyang District is a new ready-made bar area located nicely along a small river and a park but with quite uninteresting bars. Wudaokou in Haidian District, where most of the foreign and local university students hang out. 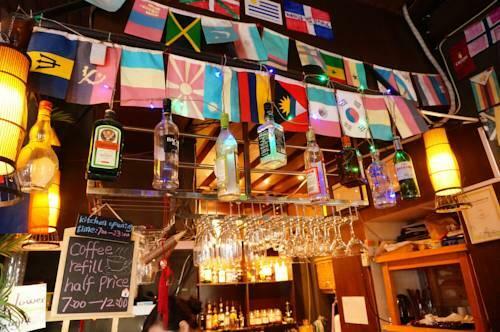 There are a number of bars and restaurants which serve a great variety of wine, beer and liquor for cheap. This area is also well known for its huge Korean population and a good place to find Korean food. Foreign visitors were once restricted to staying in high-priced official hotels. Tour groups tend to use these hotels but do so at rates far below those published. In general, restrictions on where foreigners can stay have become less and less frequently enforced. 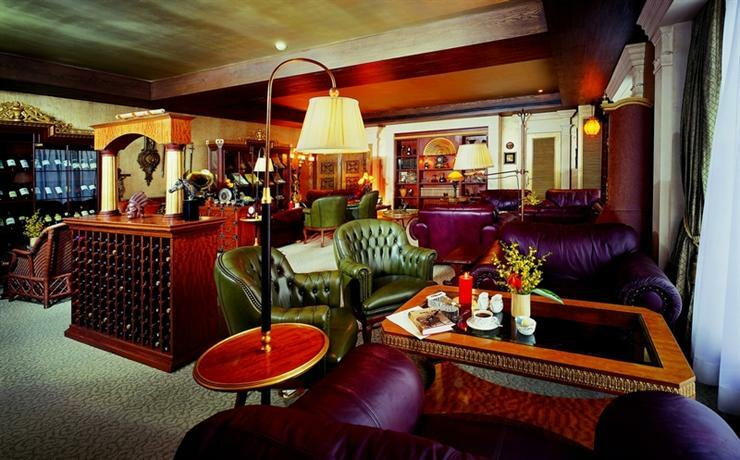 Hostels and western-style travel hotels are almost universally open to foreign guests. The lowest end Chinese accommodations - Zhaodaisuo (招待所) - are generally inaccessible to the foreign community. However, for those determined to get a bargain, you may be able to get a room if you speak Chinese. 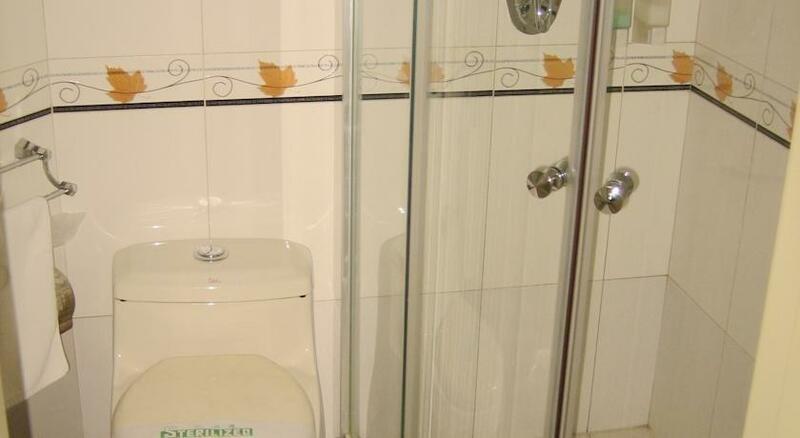 Many of the hostels are located in Dongcheng District and Xuanwu District. Discounted rates start around ¥30 for dorms and just below ¥200 for doubles in the cheapest hostels. 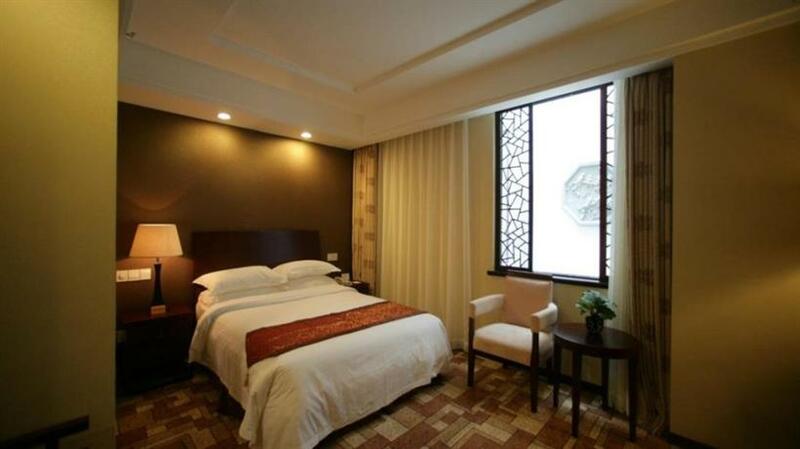 There are a large number of three and four star mid-range hotels throughout the city and in all districts. The listed rates for these kind of hotels are often in the range of ¥500-1,000 but you can often get a discount of around 50%. 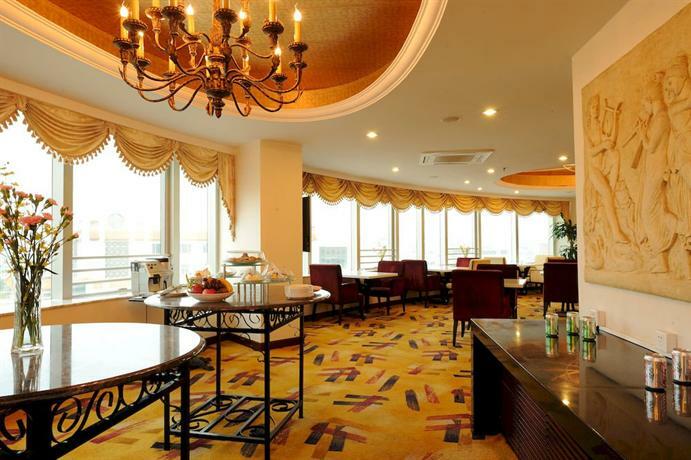 Some 'expensive' hotels are in the city centre, especially in Dongcheng District, and on the eastern 3rd Ring Road in Chaoyang District, however by Western standards these hotels are still relatively cheap. In the outlying areas, especially out by the Great Wall, are some country club type resorts as well as some unique, one-of-a-kind, hotels. 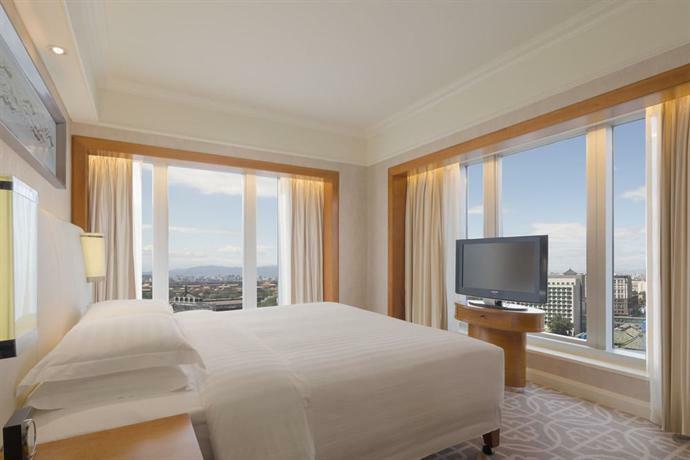 For the most expensive hotels, the listed rates start at around ¥4,000, but are often discounted to a level around ¥1,500. 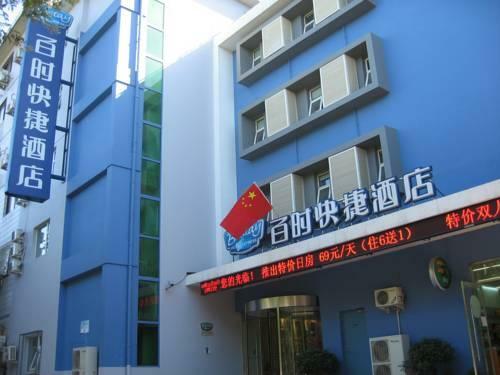 There is also a "line" of budget hostel, south of Qian Men in Beijing/Chongwen, big street on right: Leo hostel, 365 Inn, split in 2 / take left, Jing Yi shi hostel, train booking office, street on the left to Leo courtyard, Far east hostel. AirBnb and Couchsurfing are very active in Beijing. A single room for ¥180 is easy to find. For longer term accommodation, be prepared to splurge as Beijing's real estate prices are among the highest in the world; even higher than those in many major Western cities. Remember these three telephone numbers; they are valid in almost every part of China. Despite its size, Beijing is a very safe city, and violent crime is extremely rare. However, tourists are often preyed upon by cheats and touts, who attempt to pull a number of scams on tourists. Be especially cautious in the inner city, around Tiananmen Square, and on the tourist-crowded routes to the Great Wall. Petty crime is also relatively common, so you should beware of pickpockets in crowded areas and avoid leaving your belongings unattended. On the other hand, fears of scams have led many travelers to be overly dismissive of Chinese people who approach them. Many Chinese are tourists in their capital for the first time as well and they are genuinely curious about foreigners and may just want to practice their English and get a picture with you. Being asked to have your picture taken is very common and there are no known scams associated with this. Be friendly but don't feel pressured to go somewhere you hadn't planned on going in the first place. If you are outside the tourist areas then your chances of being scammed drop dramatically. Chinese people are very friendly to travellers and expats in general; seeing through a scam requires the same common sense as travelling anywhere in the world. Beijing scams are not particularly innovative or brutal in world-wide comparison, and as long as you keep your wallet out of sight, you can always walk away without fear of violence or theft. That said, there are some common scams to be aware of. For tours to the Great Wall, be wary: the driver might just stop and set you off before your destination. Only pay afterwards if you are absolutely sure you are at the destination. Do not go for organized tours to the Great Wall in the ¥100-150 range that are advertised by people handing out flyers around the Forbidden City (or in the latest scam, masquerading as the real bus service to the Great Wall which only costs ¥20, but is guaranteed to waste your entire day). Conveniently you are picked up from your hotel (so they know where to get back at you, in case you will not pay), you end up on a shopping tour and afterwards you have to pay upfront to get back to the city. Of course, there are exceptions, and people showing letters of recommendation from their previous travels and pictures are usually ok, as are people offering trips to the wilder parts of the Great Wall (i.e. not Badaling or Juyong). Shopping tours are also advertised from certain hotels; ask in advance for a tour without shopping to be sure. Bus line 877 to Badaling Great Wall only departs at the north side of the Deshengmen Building, just under it. Do not believe anyone on the way from Jishuitan subway station to the bus stop who will lead to scams. Do not be tricked by people offering to go out for a beer or coffee to practice their English. Often young women though often even middle aged women. They will usually claim to have visited your town on some uninteresting business. Some scam artists will run up an elaborate bill by ordering food or alcohol and then expect you to pay for it or even half whether or not you do or do not eat the food they order. In Chinese culture if someone invites you out for tea or dinner they pay the bill. If you are feeling this situation is about to happen, shift credit cards out of your wallet by going to the bathroom or while sitting at the table. The scam artists can be working with the restaurant and the restaurant will ask you to pay with a credit card. Another sign if it is a scam is if they ask to follow you to a bank or back to your hotel to get additional money to pay them back. These people can come on very nice and come off as very nice people. If they want to follow you back to your hotel or hostel have them wait in the lobby and do not return. These people will likely avoid confrontation and eventually leave. These cases tend to happen mainly when you are alone. In any case, be nice and refuse politely; that will do the job for you. They are particularly common around the exit of the Forbidden City. Do not follow any "students" or Chinese "tourists" wanting to show you something. They are most likely scammers or semi-scammers. Examples include "art students" who bring you to their "school exhibition" and pressure you to buy art at insanely inflated prices. Tea sampling is another scam. It is free to sample tea for locals, but for tourists...you should ask. Always get prices in advance and keep the menu if you are concerned. In one incident, after sampling 5 types of tea with two "students", a group of tourists were confronted with a bill for ¥1260! They even produced an English menu with the extortionate prices for sampling. Young attractive female "students" also try to lure male tourists to shops, restaurants or night clubs. The prices at such places can be extremely high for basically nothing. Agree to a price in writing beforehand before taking a rickshaw (pedicab) and make sure you and your driver know where you are going to be taken in advance. If not, you might get into an argument with the driver and end up paying a lot more than is fair. Rickshaw drivers generally charge ¥5 or ¥10 more than a taxi for short distances. It could be more for longer ones. Be very careful if someone wants to give back the largest currency bill (¥50 and ¥100) by the excuse of "no change". In an attempt to pass you a counterfeit bill they may tell you that they have lowered the price in your benefit. Or, they may ask you to contribute an additional sum in order to pass you the ¥100. If they give you back all the change money plus the coins on top (though coins are rare in Beijing) take your time to check each bill carefully. Another version of the above trick is when a vendor refuses to accept your ¥100 bill claiming that it's fake. The truth is most likely that he took your genuine bill and discretely changed it for a fake one which he now is trying to give back to you. Hard to prove unless you saw the swap. To check any ¥50 and ¥100 bill you get, do this: most importantly, check the paper. If its torn, thin or very slippery, ask for a different bill. Next, check the watermark, it should blur out softly. If there are hard visible corners in the watermark, reject the bill. Last, check the green "100" imprint on the lower left corner. It should be clearly painted on the bill so you can both feel and see a relief. If its missing or not palpable, reject the bill also. Rejecting bills is not considered impolite. It is perfectly acceptable to hand back a bill and ask for a different one. If the vendor gets upset, you should consider cancelling the purchase and moving on. If the colouring of a banknote is faded, it does not necessarily mean it is fake. Traffic can be crazy in Beijing, and reckless driving is fairly normal. People honk all the time. Honking is not usually considered rude. It is simply another way to indicate that the driver is there. Be prepared for drivers to violate traffic laws even to the extent of going in reverse on highways to back up to a missed exit or driving on a sidewalk. Also expect occasional road debris (a piece of wood or torn out tire) to be laying in the roadway. Pedestrians should be very careful crossing the street: People will generally stop for you, but they will honk. Keep an eye on the locals and cross with them — there is strength in numbers. Cars don't need to stop at a red light when they are turning right. Althouth the traffic law gives the first priority to pedistrians, not every driver obey the rule. See the Chinese Stay Healthy article for general health and food advice. See Chinese Smog article for air pollution issues. Tap water in Beijing is generally not safe for drinking. Locals always boil the tap water before they drink it, and you should too. Hygiene for cooked food is generally not an issue. Chinese people place a lot of emphasis on the freshness of their food, so any food you eat is usually cooked to order. However, be wary if you plan to eat cold or raw dishes. Air pollution and smog has traditionally been a big problem in Beijing like any other big city in China. Coal burning and industrial emissions in the surrounding region makes for very unhealthy air. The air quality in winter is notoriously the worst but since 2018 management of air quality has vastly improved air quality during the winter, but a haze of hazardous air can strike at any time. The worst months for average air quality are in March and November. It's a good idea to check the air-quality readings online first thing every morning. Hazardous air may continue for several days before precipitation or a gust of wind clears the air. Readings of air quality updated by the hour for Beijing and other Chinese cities can be found at aqicn.org. If it is "unhealthy" or "hazardous", consider cutting back on your activities if they are likely to involve a lot of walking outside, in favor of visits to museums or shops. There are many hospitals in Beijing, but the public hospitals that most locals visit are generally not up to the standard that foreigners from Western countries are used to. In addition, it is unlikely that any of the doctors or nurses would be able to communicate in English. Ambulance services are unreliable, and in the event of an emergency, taking a taxi is usually much quicker. There are several private hospitals in Beijing that are set up specifically to cater to expatriates, the most well known and expensive one being Beijing United Family Healthcare. The doctors and nurses at these hospitals are able to speak English, and the standard of care is usually on par with the West and far superior to what the local Chinese have to put up with. However, they are generally very expensive if you are not covered by insurance. Go to US Embassy's medical facilities listing for a complete list. You can get a free map from a Beijing tourist information office (near most tourist places). Many available: One south of Qianmen subway station, hours 08:30-18:00. The Great Firewall of China blocks popular web services including Facebook, Twitter, Youtube, Google, and Yahoo. Some of the websites that are partially blocked include Wikipedia, BlogSpot, WordPress, and Tumblr. To overcome these restriction travelers use VPN services that unblock these favorite websites. PureVPN and ExpressVPN are two good choices as they both offer excellent-level of unblocking and anonymity features. Also, PureVPN is cheap and works on many devices and it also a wide range of vpn servers. VPNs also help travelers to access Public Wi-Fi Hotspots securely. Free Wi-Fi hotspots can be found in Costa Coffee, Charlie Brown Café, Starbucks (requires a pin which is sent to your phone upon request), McDonald's (you can use it for 30 mins after connecting ), and many other small independent cafés. These cafés can look like restaurants from the outside, but most any place that is called a café will have Wi-Fi. Most of the hotels and hostels have Wi-Fi services, but most of those Wi-Fi connections are weak and unstable. If you cannot live without the internet. Choose a place which has a proper Wi-Fi facility through Airbnb. Laundry is very expensive to be done in Beijing, both at the hotels and at laundry service shops since they both charge by piece. The best alternative is the Jing Quan laundry service located at the Beijing University where you can have a full machine of clothes washed for around ¥10. It is located next to several dormitories in the southwest corner of Peking University. Simply enter the campus at the southwest gate and then walk east in a straight line. Friendly Peking University students you'll encounter while holding your sack of laundry will be glad to point you in the right direction to Jing Quan; it's about a 5 minute pleasant stroll away from the southwest gate. It's especially convenient if you're going to the Summer Palace as it's a nice stop along the way. There is also a laundry delivery service called Laundry Town. Tianjin — Around 30 minutes away by fast train, Tianjin is a large city in its own right, contrasting with Beijing due to its colonial European influence. Tianjin even has a charming Little Italy area in addition to other interesting historical sites. Mongolia — If you intend to take the Trans-Siberian Railway to Mongolia you can take an overnight sleeper bus from e.g. Muxiyuan Long Distance Bus Station (木樨园长途客运站) to Inner Mongolia's Erlian (二连) which costs ¥180. Bus tickets can only be purchased at day of departure. Buses from Erlian to Zamyn-Uud leave from Erlian bus station on the corner of Chaha’er Street and Youyi Lu near to the Mongolian Consulate. There is a bus at 13:30 and at least one more later in the afternoon around 15:00. Taking the 13:30 bus should give you enough time to get on the 17:35 Zamyn-Uud to Ulaanbaatar train. This, however, is subject to tickets being available when you arrive in Zamyn-Uud, which, if you arrive in the afternoon, may be unlikely. The process when taking the bus is pretty much the same as when taking the jeep, only since more people have to get off the bus, go through immigration, and get back on the bus again, it takes a little longer. That said, you should be able to get from Erlian to Zamyn-Uud in around two hours. The price is ¥40 plus the same ¥5 exit tax. Chengde — Just 4 hours by train or bus and 2 hour by car, visit The Summer Mountain Resort (256 km northeast of Beijing). Shanghai — Largest city in China, and either a 2 hour flight, high speed trains taking as little as 4.5 hours, or even a high speed sleeper away.